WEAR: Festive Cocktail attire in your favorite shade of blue. We will have dinner catered by Keo, a silent auction, a sweet dessert dash, and a cash bar available. Click here to purchase tickets or a table! Click here to download the table or sponsorship form. One table for eight guests. One table for eight + eight drink tickets, recognition at event, and on pre-event materials including the LBH website, social media, and email blasts. One table for eight + 16 drink tickets, recognition at event, and on pre-event materials including the LBH website, social media, and email blasts. 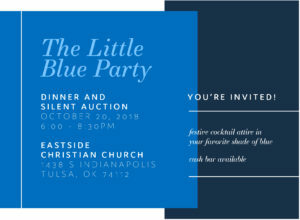 If you are interesting in helping event plan, or donating an item for the silent auction please email linda-davis@utulsa.edu.